I must start with a confession! I had intended to start this over a month ago to coincide with start of the growing year. So I will need to provide a quick summary of where I’ve got to so far. On the hard landscaping side, last year we rescued an old conservatory from a house in Edinburgh that was being refurbished. 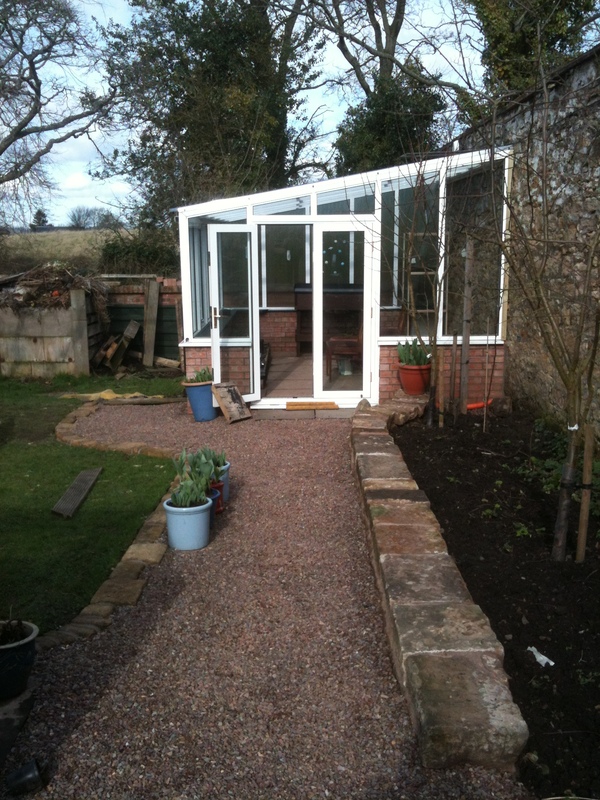 It has been rebuilt at the bottom of the garden to provide a third greenhouse area. Mr Mac has provided me with two raised beds, shelving and a potting bench. It looks so good it has inspired him to build more paths and walls to link all the growing areas in the garden. 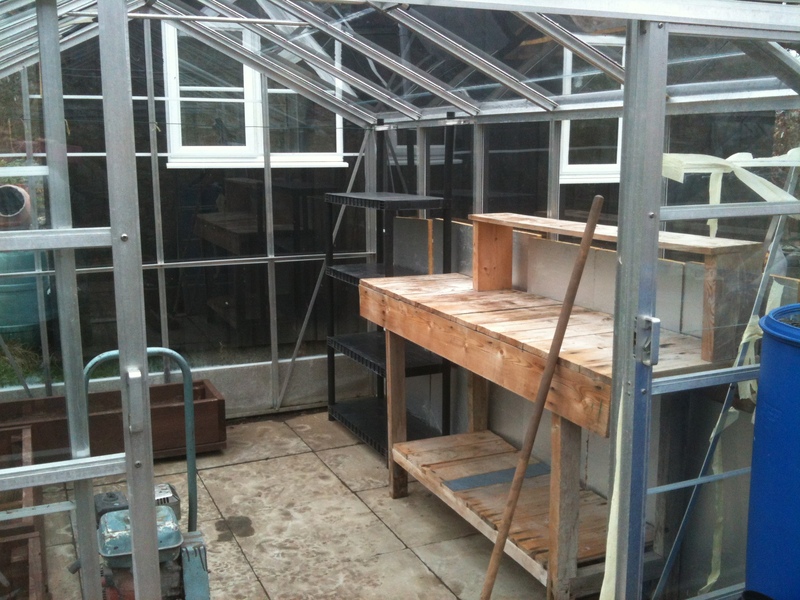 The other two greenhouses have been bleached and fumigated and are raring to be put into action. Flower seeds planted so far- sweet peas, livingstone daisies (see banner for last year’s flowers), cosmos, osteospermum, rudbeckia, verbena, coreopsis, gazania, dahlia pom pom, silver dust, marigolds, lavender, snapdragons, morning glory, aster, iceland poppies, sunflower waooh! (grown in pots) and helichrysum. Veg seeds planted so far – carrots, chilli (bird’s eye, razzamatazz and hotscotch), tomatoes, melon, peas, aubergine, red cabbage, brussel sprouts, brocolli, okra, aubergine, courgette, sweet basil, lemon basil, leeks, lettuce and early potatoes. Disasters so far – 1! A friend gave us a heated propogator so we could bring on some early tomatoes and chillies. I cooked them! Second attempt is better with the first chilli seed germinating just this morning- wey hey! I am trying lots of new flowers and veg this year, in particular, aubergine and okra. I am also going to try an area filled purely with cut flowers. I also have plans for a “blue wall”. Last year we replaced the old snow damaged fencing with a trellis and pergola and this year I have planted blue morning glory seeds and blue sweet peas, both vigorous climbers, which will hopefully cover both with gorgeous blue flowers. Anyway, Mr Mac is calling for my assistance in upgrading one of the veg beds so best go and help! This old conservatory was being thrown in a skip. All we had to do was build a supporting wall at the bottom of the garden to sit it on.